If you've been around here the last few months, then you know that our family room remodel is taking for...ev...er...!!! 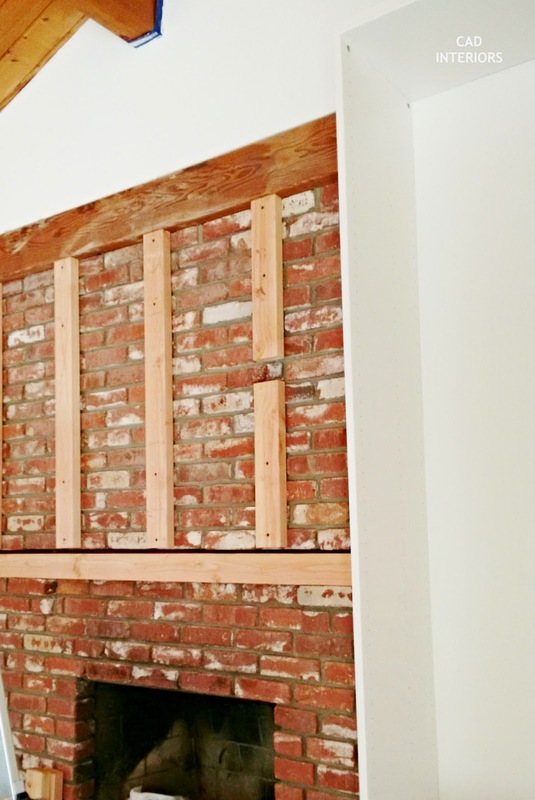 We hired out the bigger aspects of the renovation, and decided to DIY the "manageable" projects to save money. That being said, those DIY renovation projects have lingered longer than anticipated. Our busy schedule just doesn't leave much time for DIY home improvement. But even slow progress is progress... Even in its raw construction state, the room looks much improved since we bought our home two years ago! As you can see above, the top portion of the brick on the fireplace has been covered. I had to re-work the design several weeks ago after realizing the pre-fab cabinetry that we purchased for the shelving units would not accommodate a television. 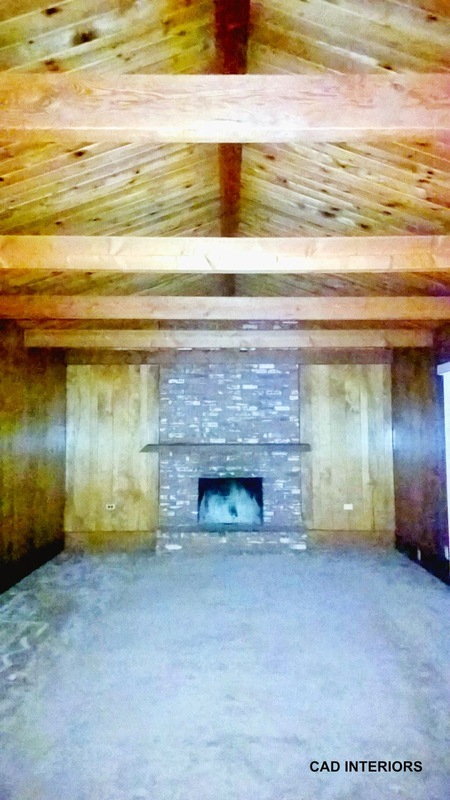 The original design of the built-ins was much simpler - with the TV housed on a shelf in the cabinetry (with no need to build out the top of the fireplace). I have always preferred that televisions NOT be mounted over a fireplace for two reasons: 1) I prefer to keep the focal point on the fireplace and not have it compete with a black TV box, and 2) I prefer eye-level television viewing (no strained necks). As luck would have it, our television has to be mounted over the fireplace. The cabinets we used are side-by-side units that don't have the width to accommodate a TV. We don't want to cut the panels and compromise the structure, so "Plan B" it is. 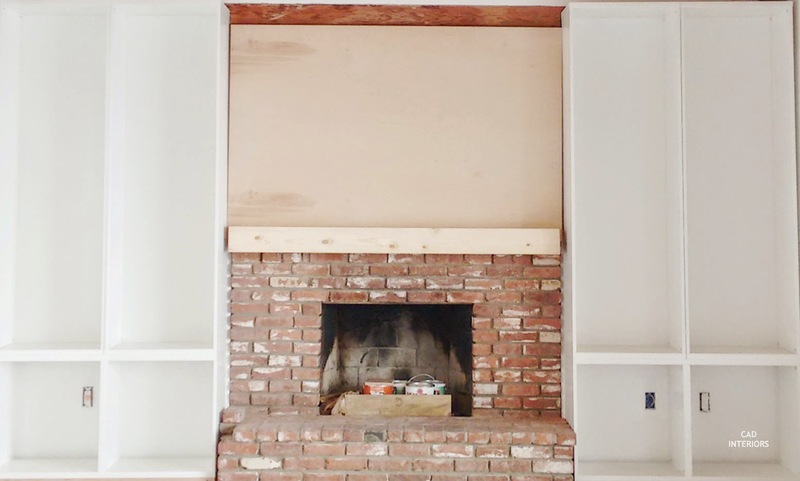 In order to mount the TV and conceal the hookups (since we didn't have electrical installed in the brick), my handy hubby built out the top portion of the fireplace. 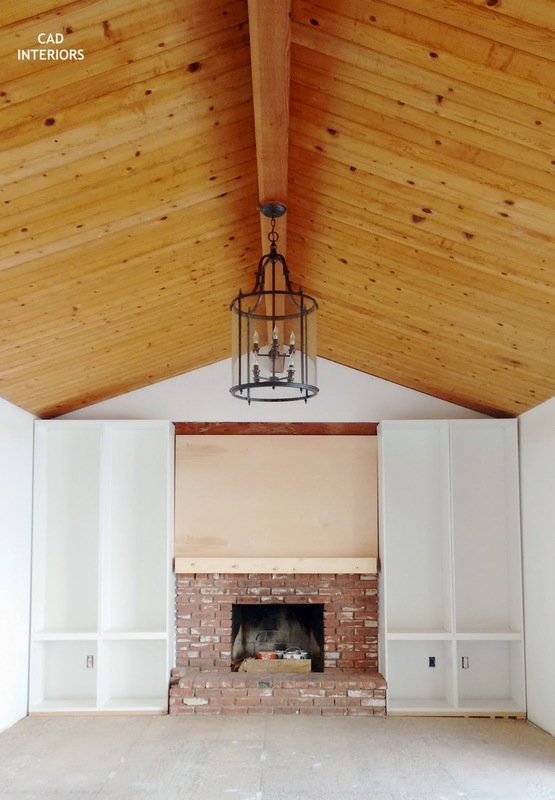 The electrical will run discreetly behind the wood frame and will be connected to the junction box behind the shelving. Here's a look at part of the construction process for building out the top half of the fireplace. Since this photo was taken, additional wood slats were installed to account for the placement of the TV wall mount. My hubby will drill into the wood (which will serve as studs) to mount the television. It may seem straightforward, but there was A LOT of measuring, leveling, and re-measuring involved. Custom doors will be installed on the bottom shelves for concealed storage. The top will have open shelving. Click here to catch up on all posts related to the family room remodel! It already has gone from drab to fab! I am on the same page about mounting a tv above the fireplace but with your room's layout, I too, would put it at the same spot. You guys did a lot of work but it will pay out. I want detailed post about the molding! ps. oh my that chandelier! Hi, thank you! I can't wait until all the DIY projects are done in here. There really isn't much left... just takes time that we lack! :) I will document the trimwork and molding effort. I just hope we don't encounter too many obstacles.